The 2016-17 ABL Semi Finals Series are now locked in with the #1 seed Hong Kong Eastern Long Lions (15-4) to face #4 seed Saigon Heat (8-10) in one semi final series while the #2 seed Singapore Slingers (12-7) will face off against #3 seed Alab Pilipinas (10-9). For the Singapore Slingers the match up with Alab should be interesting as their is a large number of basketball loving Filipinos living and working in Singapore who are expected to snap up the play-off tickets. 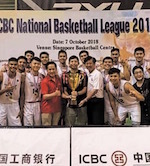 Slingers management are calling on the local basketball community to get out and support their home team which is led by local Singaporean head coach Neo Beng Siang and features 9 local Singaporeans in the Slingers 12 man roster. After a herrendous run of player injuries during the 2016-17 regular season the Slingers hope to be back to near full strength by the time their semi final series tips off on Sunday 2nd April at OCBC Arena in Singapore.